Global Youth Peace Summit from The Amala Foundation on Vimeo. The Amala Foundation is a humanitarian service organization based right here in Austin that provides personal growth and leadership development opportunities to over 1,500 youth each year. One of the Foundation’s projects is the Annual Global Youth Peace Summit, a week-long experience dedicated to personal growth, healing, cultural exchange, leadership development and community building. This year’s Summit will bring together 70 youth representing over 20 countries for a week dedicated to personal growth, leadership development, cultural exchange and community building. 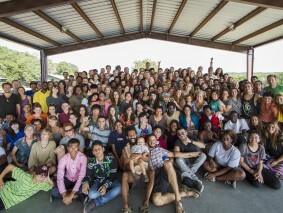 The 9th Annual Global Youth Peach Summit will take place August 10th-16th at John Knox Ranch in Wimberley, Texas. Applications are open online until March 20, 2015. All decisions will be made by April 15th. The Foundation offers partial and full scholarships for youth to attend the Summit. Approximately 75% of the participants are on scholarship.